Review to the book "A Crown of Roses"
Mr. James Shea, at the prologue, explains that she and her husband visited Europe and affirms that the author herself has said that this trip influenced her poetry. This reference to her real life will float over the mind of the reader through the reading, and certainly will adjoin special enthrallment to the story that is magisterially presented afterwards. 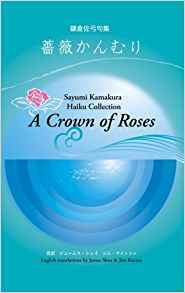 Book: "A Crown of Roses"
We can say this book is a testimony. Initially, we are aware of the presence and the show up of an uncommon talent. At the end, we may conclude that we are spectators of a drama that takes place into a human soul: the soul of a woman. For now, I will only say that this book is analytic on the feminine soul, if there is anything that may be called that way. Call it love, joy, sadness, isolation or desperation coexisting into any woman´s heart. This is not a drama where the author is protagonist. Any member of her gender will smile or be perturbed by her statements, because they will feel instantly portraid at every moment and will understand all the signals and symbols she offers all along her poetry. But, which are the main qualities I have seen in her haiku poetry collection? The haikus bring up colorful images, a coherent story and a philosophical meaning, all at once in each scheme. The images are not only powerfully colored, but also panoramic, kaleidoscopic and tridimensional. The book recreates a story where the haikus are chapters organized in six parts. The story is easily followed by the reader, who never looses the focus in these sequenced episodes of her life, synchronized like spider threads in a spider net. The sequence is not lineal but also encircled one with the other in a go and return play, like a sophisticated ballet. She creates a drama where typical fears like agedness, death or loneliness, are not absent. This is a puzzling book that encircles a puzzling story. This initial haiku is able to develop into the reader´s mind, a rare soup made of adrenaline, mystery, suspense and intrigue. Like an Agatha Christie of the Haiku, this author shows the "how to" of being free from the commonplace without breaking the rules. Haikus are embroidered around human life and specially around the interchanging of good and bad energies among human beings. Is that a Mona Lisa´s smile? What does it means? Are we part of nature? Are we artificial robots? Have humanity lost the contact with the universe? Happiness may rest in the return to a more natural life? She is never dubitative when she uses her own life as a testimony. Not her real life, but her inner life: her insecurity, her terrors, her passion for love, her love to nature itself. She shows her own contrasting vulnerability and strength, her love towards nature and human nature, the encircled space of the hotel room and the enormous space outsides. She remarks the curious disparity between depression and joyfulness, life and death, care and indifference. There resides the universality of the book. She is brave soldier in a war: the war against ordinarily. She takes wings beyond the limits that the technical structure imposes, being this, her major virtue. This oscillation among classical structures and a singular, unique way to write, make an exquisite mixture in Sayumi´s poetry. The reader takes immediate contact with her delicate soul, not free from melancholy and isolation but also owner of joyfulness, clever irony and wise humor. Her flowered imagination submerges the reader from the very beginning, in Japanese cultural meanings. She sends the reader´s daydream from near to far away, making the visions to be panoramic and increasingly rich. She easily manages our imagination and takes power over our feelings too. Is she requesting for dignity? Are all of us far away from treating human beings and specially women with respect? The book includes lively events chained as a unique story, expertly combined so that they serve as support to the author´s philosophy. There is an Agatha Christie´s thread that unifies each poem and each block of poems to the next, returning to the beginning, surrounding her personal story, arriving to an unexpected end. Sayumi builds a subjectivist story, not as much by the presence of metaphors, but by the permanent presence of psychic, emotional, affective and cognitive state of mind superposed to reality. The first and the second part are classical, and seem to be written in a different moment. In the second part, all is light, outdoor images and calmness. In the first one, in contrary, all is intrigue, irony and mystery around human spirit. This book finds its way, is clear, solid and effective. It has emotional cleverness. There resides the clue to understand her writing. This is a style with a name: the Sayumi´s style. Far away from clichés her otherness unifies the universe from where she writes, (from her own literary schemes, in her own poetic spirit and her own cultural baggage), to arrive without scales to the other into the reader: another soul, another mystery, another skin. Maria Cristina Azcona is an Argentinean poetess and writer. She writes bilingually in Spanish and English, her second tongue. Her writings have obtained several prizes in USA, India and Argentina. She was born in 1952 in Buenos Aires where she lives joined to her husband. Also she is a mother of two. Being an Educational Psychologist and family psychotherapist, she has obtained two university degrees, one from USAL, Argentina in 1975 and the other from Navarra U, Spain in 1999. She has authored six books, two of them published by Cyberwit.net. She is coauthor of six books and participant in various poetry and literary anthologies. She is Editorial Advisor for the "Taj Mahal Review". Since she is founder director of the Bilingual MCA group of poets, her articles have been published by UNESCO-EOLSS at UK in 2005. Among other distinctions, she is IFLAC- South America director and Academician member at many educational and literary institutions, internationally. Well, as am 'thinking I dinna ken Muckle of Celtic, then comes McDonald ! And all the reading I've done of the works of Robert Burns and Sir Walter Scott will make any willing traveler more familiar, certainly not fluent, in a wonderful and ancient language that gave us much of what we call modern English, for a'that, as the Bard of Scotland might say. Ban’ya Natsuishi and Sayumi Kamakura have both taken 50 of their best creating a wide variety of Haiku that haunts you like the ghosts of ancient scripts and combined them into 100 Haiku. Each of their Haiku, have parts of them that will take you on a journey through multiple dimensions of insights, observations, revelations and theories of life. Steven Carter, retired Professor Emeritus of English and award winning poet, has chosen critical historical locales and periods in Europe and America as the subject of his book of haiku, Morning Twilight (Cyberwit.net, 2012). Ban'ya Natsuishi writes haiku that moves beyond customary restraints and perceptions from the tradition of only seasonal, natural themes. His muki-haiku-seasonless poem style, paints Natsuishi's promptings into pictures, which embrace the philosophical images in everything, and the mind is able to roam, to contemplate the wider nature of us! Hybrid Paradise is by no means a work of mere quantity though, as is already indicated by the individuals involved. The cover design has been provided by the Japanese poet and haiga artist Shimizu Kuniharu 清水 国治; it fittingly emits a strangely familiar vibe, just as as many of the book's poems.